There are many schools of economic thought. I have listed more than twenty (at the bottom). It’s important of course to have some real understanding of these various schools. However, Marx stands alone for his work on understanding the fundamentals of how capitalism works, its inner machinations. His work was a critique of the political economy that came before him and in its fundamentals delves far deeper than the economics that has preceded him. Although the person is long dead his ideas are still very relevant and in need of an update. It is generally acknowledged that the most difficult part of Marx is Chapter One of Capital, titled Commodities. It has taken me quite some time to get my head around it. I believe that most people would require a guide or guides to understand it. It also requires a commitment to slow, deep thinking. I’m listing here some resources I have found useful with some short notes as to which areas they cover. This was published in 1859 by Marx before he wrote Capital. So it provides a briefer overview of his argument. It is useful to compare Contribution with Capital as well as the differences between first and second editions of Capital. There is considerable redrafting and evolution in Marx’s thinking. Contribution also contains a section on Method, which is famously missing in Capital. This must be one of the most contested, interpreted and reinterpreted texts in the history of texts. We can’t expect to just read and understand this text. It does need to be gone over very carefully and of course a good conversation along the way helps with learning, a lot. This is a relatively short (180 pages) introductory account of the central issues of Marx’s political economy and its brevity might appeal as a way to start. David Harvey has written lots of books including volumes devoted more closely to reading Capital. He also has a series of online videos about Volume One. This book by Harvey is the one I have been reading. He is a very good writer and interpreter overall of Marx IMO (although I am puzzled by his sometimes advocacy of a zero growth future) and provides many footnotes and references for further study. I have found this one extremely useful for understanding the form of value, as distinct from the magnitude of value, eg. Chapter 12. Content and Form of Value. The form of value has been missed or neglected by some interpreters. This contains some brief but very good sections explaining value theory. They are situated in a broader overview of the whole history of the economic methods of different schools, which helps to fill a gap left by Marx. It is quite an amazing feat really to compare the methodology of the major schools of economic thought in one volume. Saad-Filho, Alfredo. The Value of Marx: Political Economy for Contemporary Capitalism. Currently this is one of my favourite interpretations of Marx’s value theory and luckily it is online. I really like the first chapter which taught me new things about materialist dialectics and the subsequent chapters do a good job of critically explaining different interpretations of value theory including some of the more recent ones. I recommend reading the footnotes too, they are very informative. Rosdolsky gained some insights into controversies about Marx’s value theory by reading work by Marx published long after his death, such as Grundrissse. Rosdolsky is not a great writer but he knows his Marx and he sets the record straight in a number of instances. 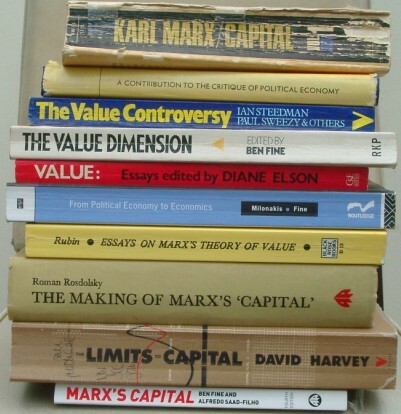 Quite a few of these resources are available on line at the Marxist Archive. Personally I find it best to buy them or print off the chapters I want to study, since the material is too dense to assimilate just by reading. My own study style is to make marginal notes and also to compile separate notes as I go along. If anyone can just read Marx and pick him up like chewing minties then good luck, i would like to meet you. Of course all of this reading is rather daunting. It’s a grunt. But it would be great to grow a community who understand and discuss these ideas and their application to the current economic crisis. Now then, we can’t really apply Marx’s ideas to the current economic crisis if we don’t understand them, can we?